This authoritative, crisply written book gives managers a detailed and practical map for improving service and quality in their organizations. At the heart of the book are 12 key service/quality improvement areas or "cylinders". 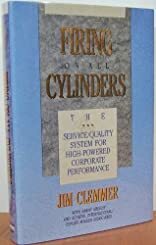 Clemmer outlines the steps for improving performance for each cylinder. About Barry Sheehy (Author) : Barry Sheehy is a published author. Published credits of Barry Sheehy include Firing On All Cylinders. About Jim Clemmer (Author) : Jim Clemmer is a published author. Some of the published credits of Jim Clemmer include Firing On All Cylinders.